If you are looking for a competition that will put you in a class of elite athletes that not many people will ever reach, check out the Bone Frog Challenge. But before you even consider taking the challenge, recognize that training for the Bone Frog is going to be about as grueling - if not more so - as the actual race. What is the Bone Frog? 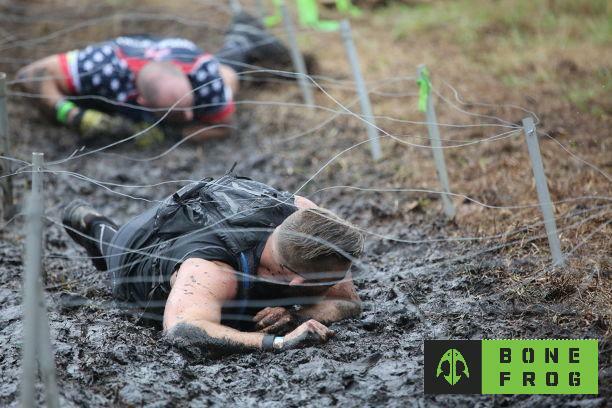 The HESCO Bone Frog was developed based on Navy SEAL training, with over 50 different obstacles on the course and ranging from three to eleven miles. It’s not just about running and endurance - if you are going to participate and make it to the finish line, uninjured and intact, your training has to be intense and all-encompassing. A combination of cardio training, resistance training, and weight lifting are all required. The key to training is to know your limitations so that you don’t end up overtraining and being injured or spending more time on the injured list than actually training. It is better to train smarter than harder. The way you build muscle is by tearing the muscle fiber apart and forcing it to rebuild. But you have to give the muscle time to repair itself or you are working against yourself. Training for a grueling race like the Bone Frog event is about training smarter, not harder. To make sure that you are taking the right steps to make it across the finish line, make an appointment with Fort Lauderdale personal training today; we can teach you the many things you need to ready yourself for race day.